DGL Powder (deglycyrrhized licorice root) is soothing to, and provides nutritional support for, the gastrointestinal tract. DGL significantly stimulates the proliferation of mucus secreting goblet cells. It also aids in maintaining healthy epithelial tissue and helps to maintain normal cell function. 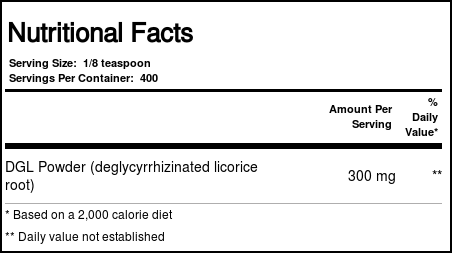 Recommended Use: Take 1/8 teaspoon, 3 times daily after meals, and at bedtime or as directed by a healthcare practitioner. 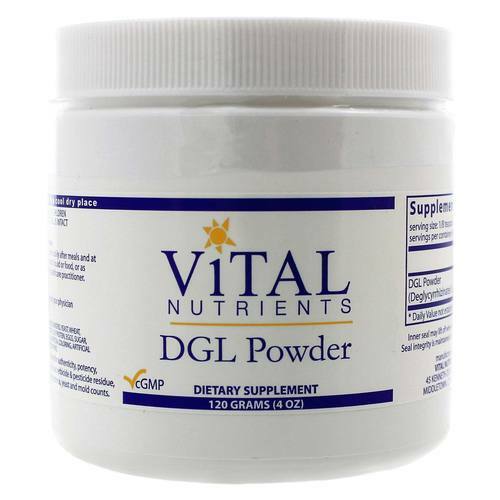 The customer reviews posted below are based on individual consumer experiences and may NOT necessarily represent what expected results will be from using or taking Vital Nutrients DGL Powder - 120 Grams. These results may not be typical and you should not necessarily expect to receive the same results. Actual results may vary. Very effective for heart burns and gastric problems.